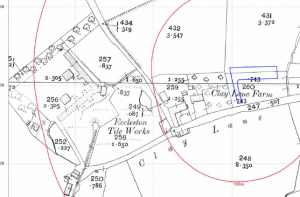 A review of the historical maps identified the ‘Eccleston Tile Works’ 100m west of the site which was active until circa 1937. A review of the environmental data for the site and records held by the Environment Agency no further potential source of contamination were identified. On completion of the desk based research, the site reconnaissance visit was undertaken. The site comprised of a barn in a field, the barn was used to store a tractor and a vehicle being rebuilt. Whilst cement sheeting was identified on the building as there was no damage to the sheeting, was discounted as a potential source. The building was inspected as part of the survey and based on site observations were used to discount the use of the building as a credible source. The area of the former tile works was inspected as part of the walkover survey, access was not available as the area was used as gardens. Based on the data on the O.S. maps and limited site observations, the tile works and in-filled land were discounted as credible sources. On completion of the qualitative risk assessment the only potential source of contamination was made ground, and given the isolated nature of the made ground it was proposed that a watching brief is undertaken to ensure the made ground is removed from the proposed garden/landscaped areas as well as from the alignment of the proposed water mains. The decision notice states the desk study report was accepted and the watching brief proposed in the desk study report should be implemented.